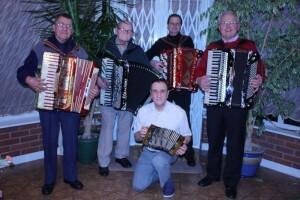 October 2008 saw a number of accordion enthusiasts discussing the possibility of forming an accordion club here in the Black Country. A committee was formed and consisted of Barry Smith, Lou Ambrose, Barbara Ambrose, Reg Philips, Fred Payne, Ron Williams and Simon Bray. 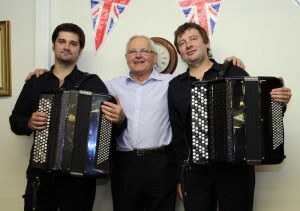 The grand opening night was agreed to be in January 2009 and Steve Roxton was the accordionist chosen as our guest artist. Tommy Mundon, the famous Black Country comedian came to provide his hilarious local humour. The Lord Mayor of Sandwell performed the opening ceremony, the local newspaper sent a reporter along and the evening was a huge success in every way. Well over 100 people turned up for the show. The club has not looked back since that first night. Due to demand from members, August 2011 saw the introduction of the social night. This was due to the fact that not all members had the opportunity to play their accordions on a guest night. The social night has now become very popular with players and visitors alike. Drum kits, keyboards etc. Appear making the evening very pleasant and relaxing for everyone. Light refreshments are made available and there has been a steady increase in visitors over the past few months. The committee agreed that as soon as the club was financially sound we would support various charities. Our favourite charity is ‘Starlight’ which helps make wishes come true for poorly children. Other charities include Wateraid, Cereba, Cancer Research and a donation has been made to the local hospice. The club support the Kyiv Duo when they make their annual pilgrimage to the club. This fabulous accordion duo support the Chernobyl Nuclear Disaster Fund, helpng children affected by the radiation, causing deformaties, etc. We are pleased to have made substantial donations to their cause. A profile of BARRY SMITH. Barry Smith is the chairman and founder of this club. I am very pleased and honoured that Barry asked me to join him in this venture. The idea was to resurrect the interest in the accordion. We both experienced the loss of friends and players and noticed that the numbers were rapidly dwindling. Although a non player I had very firm ideas of what I wanted to hear from accordionists and exactly what sort of entertainment I wanted to enjoy. Barry had exactly the same philosophy and this is the reason that we can work together so well and also the reason that the club is so successful. I produced a series of videos, working closely with the late Malcolm Gee. I also did commercial work for the local authorities. I was in need of a Black Country song for a job and Malcolm promptly put me in touch with a Barry Smith who appeared at my home, sang and played a Black Country ditty and my problem was solved. This was my introduction to Mr. B.Smith. An experienced accordionist and entertainer, very obliging and refused payment for his trouble. What I never knew at the time was just what a well known and experienced player Barry was. He was encouraged by his parents and grandmother, who was a violinist and harmonica player, to learn the harmonica. He began entertaining his school chums and played in the school concert. In the early fifties, William, his father encouraging him to play the accordion, took him along to hear Les Devaldi and his Junior Accordion Band playing at the local Odeon. At the time this was a very well known and successful band. Barry then became a pupil of Les Devaldi and graduated from a 24 bass to a 120 bass accordion. In 1955 he entered his first competition, gaining a silver medal for second place. He played in the junior band for the next 5 years , touring and sharing the bill at many venues with names like Max Bygraves, Mike and Bernie Winters , Cleo Lane, Johnny Dankworth and the Cyrel Stapleton Orchestra. Max Bygraves attended the Tulip Festival at Canon Hill Park and Barry played ‘Tulips from Amsterdam’, standing under a windmill, from 10 o’clock till 5 o’clock, whilst dressed in a Dutch costume. As the horizons broadened and confidence blossomed Barry set about entertaining at local clubs and churches and soon he moved to the local secondary modern school where he joined the school orchestra and began playing the cello and later joined the school drama group actually taking part in the Malvern Drama Festival. At this time Barry began to meet and get to know many musicians and also began to get his own portfolio together. He played at the local churches, clubs and hospitals. Whilst in the second year at the secondary modern school he was encouraged to take up the cello and played in the school orchestra in a competition. Taking up acting and drama added more and more to his confidence and experience on stage. At the ripe old age of fifteen he left school and became an apprentice pattern maker at Firth Vickers and most of his evenings were taken up playing in concerts and BTH variety shows. Christmas time was a very busy period as he would do charity shows. The concerts and shows began to pay dividends regarding friends and contacts and Barry became a firm lifelong friend of Tommy Mundon, the famous Black Country comedian. At this time Barry ventured into a Bavarian Band. During the period of employment at Firth Vickers he formed a friendship with Bill Brady a former Pipe Major of the Cameron Highlanders. During their lunch breaks they taught each other to play their own instruments and Barry ended up playing the bagpipes at the Christmas show at the Alexander Theatre, Birmingham, his Highlander costume being made by his mother. In 1962 Barry was becoming a regular in the Pipe Band and they were engaged to take part in a pantomime at the Alexander Theatre. They were all nervous as the all-star cast included Beryl Reid, Frank Ifield, Ted Rogers and the Dallas Boys. Frank Ifield presented Barry with a 21st. birthday gift, a wallet which is still a very precious memento to Barry today. From here he went with the Pipe Band to the New Year all-star midnight charity show. On the same bill that night was Frankie Howard, Frank Ifield, Norman Wisdom and many other stars. For the next few years he was a regular at the pantomimes before moving on to doing a regular Bier Kellar at the Coventry Bier Kellar. From there he moved to the Kings Head, Bearwood. The band was a huge success and played to a full house every night. On the night of the terrible Birmingham bombing Barry was playing at Bogarts Bier Kellar and badly injured people poured into the club, the police asked the band to keep playing throughout the chaos. After sixteen years he left the Bier kellar and joined Roger Crawford and Roger Armstrong in the Frankfurter Shunkel Band. This was a highly successful band and played at venues all over the UK. As his reputation grew Barry began to receive bookings for more prestigious venues like The Cheltenham Festival and after three years he was joined by Sid Powell and Kevin Griffiths. They were promoted to a prime spot by the parade ring. The bookings spread to Royal Ascot, Epsom Derby, The Royal Welsh Show, The Three Counties Show and many others. The most enjoyable show of all was playing at the opening of the Desert Springs Golf Complex in Spain where they entertained a truly international audience. Even with a busy diary of bookings Barry still finds time to run Barry Smith Entertainments, a business that hires out anything from a skittle alley to full blown marquees. He has helped my charity events by supplying skittle alleys and side show features, all free of charge. He himself played at the Bob Champion Cancer Fund event at Arundel Castle. £100000. being raised for the fund.